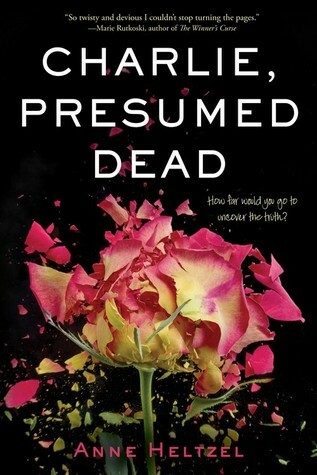 Charlie, Presumed Dead was a book I really wanted to like, but ended up having to walk away from out of sheer apathy. There are some titles where alternating narrators serve the plot. This is not one of those. I truly believe this book could have been a whole lot more enjoyable if the author had picked one unreliable narrator instead of three. I don't mind an unreliable narrator, of course. What I mind is an unreliable narrator who doesn't give me a good reason to be on their side. Lie to me all you want fictional storyteller. I'm okay with that. Just don't be boring about it. I made it about a quarter of the way through the book before I bailed on it. We've got our three narrators: Aubrey who won't shut up in her chapters about wanting her journal back that Charlie stole and how it'll ruin her if anyone finds out what's inside (protip: Aubrey, you really don't seem important enough for anyone to care.) Lena who keeps telling us nobody can trust her and that she's into things for her own ends but doesn't seem to actually show us why we should be backing away slowly. Charlie who's just a skeezeball who can't keep it in his pants and likes to reinvent himself presumably in the name of getting laid or at least the thrill of manipulating people. I'm going to go ahead and assume that at some point we find out what's in that journal, that Lena gives us a reason not to trust her instead of just telling us not to, and that Charlie's very probably not dead. Maybe Lena kills him in the end so that all the expense and such of the funeral at the beginning isn't wasted. I don't know. I don't care to know. This seems to want to be Gossip Girl meets Murder Mystery, but the quality of the writing just isn't there in order for me to care about these characters and their story. It seems to be trying to brand itself as a thriller. It's not. The two female MCs are boring and catty and Charlie's just another rich kid who has to be the center of attention so much he (probably) fakes his own death.